Chiropractic care is the art and science of balancing and aligning the spine to achieve maximized mobility and nervous system function. Our job as chiropractors is to keep your spinal column free from nerve interference. This natural, gentle approach to good health helps to keep you feeling fantastic and performing at optimal levels. We offer our patients a wide assortment of well-respected approaches that have stood the test of time. 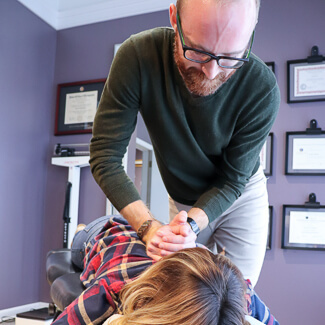 We use both manual and instrument-assisted techniques, and accommodate those patients who prefer an adjustment style that requires no twisting or popping of the spine. Some of our choices include Activator Methods®, Cox Flexion-Distraction, Diversified, Gonstead, Thompson Drop Table and Webster Technique. 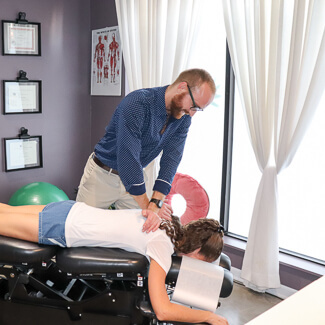 Total Balance Chiropractic also stands out in the treatment of athletic injury and physical performance. Dr. Andrea and Dr. Luke are both certified Active Release Techniques® (ART®) practitioners. ART is a manual approach that gently breaks up adhesions, knots and scar tissue in affected areas, helping muscles to glide and move freely. 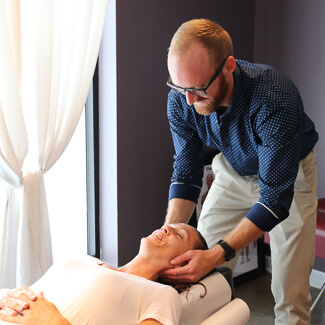 Most of our patients receive immediate relief from pain following one of our gentle treatments. If you want to live your best life and age gracefully, chiropractic care can make those dreams a reality. We accept insurance and walk-in appointments are always welcome. Contact Total Balance Chiropractic today; we’re open late!